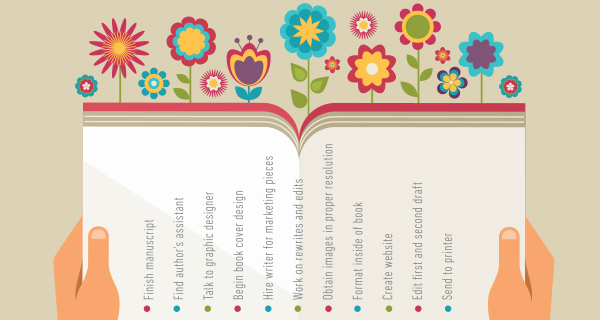 Home » Design » How long will it take to publish your book? Producing and publishing your book once the original manuscript is finished: 3-5 months. 1. Manuscript evaluation and editing: 2-4 weeks. 2. Rewriting: 2 weeks to several months, depending on your schedule. 3. Front cover design: 2 weeks for initial layouts, 1 week for edits. 5. Copywriting for author’s bio, website, and marketing materials: 4-6 weeks. 6. Page design and formatting: 2-3 weeks. 7. Final edits: 1-2 weeks. 9. Printing: 2-4 weeks, depending on size of book. Suggested production schedule for a five-month period shown below. Numbers correspond to list above. Author’s assistant – While you’re busy with edits and rewriting, tasks such as fact-checking, purchasing an ISBN number, obtaining permissions, and coordinating between the author, editor and designer can be handled by an author’s assistant. This person can also arrange for peer review and feedback on passages that might be confusing to readers. Graphic Design – The cover design can be started while the editing and rewriting take place. It’s important to have the cover design finished for use on your website. For your initial meeting with the designer, bring examples of book covers you like and explain what drew your attention to them. This will help your designer understand what appeals to you. It’s helpful to share with your designer the reason you wrote the book and what you want readers to take away from it. Your designer will need to read at least part of your book to get an idea of plot and style. If you have specific ideas about the cover design let your designer know, but be open to alternate suggestions you may not have thought of. If you want the designer to format the inside of your book make sure your text has been edited and rewritten to your satisfaction before sending it to them. This will prevent major text revisions later, which will save you time and money. The designer should provide an agreement for you to sign, specifying the number of layouts to be provided, how many revisions are allowed of the chosen design, and what the charges are for additional layouts and edits beyond the ones outlined in the agreement. Marketing – If you’re not experienced with writing effective sales copy for marketing, consider hiring someone who is. It could save you time and make your book more profitable. Your graphic designer might be able to recommend someone, since they often team with copywriters on other marketing projects. Website – There are a couple of different ways to produce your website: (#1) Hire a designer to create the whole thing, including text and images. (#2) Write and set up the website yourself using a website building platform like WordPress.org and pay a graphic designer to create your banner and images. Option #1 will save you time and free you to focus on other production tasks. Option #2 could save you money if you’re comfortable with using a website building platform yourself. Photography and images – Hire a professional photographer to take a bio picture 1-2 weeks before your cover design goes into production. Make sure the photographer provides the image in high resolution (300 dpi). It can be converted to lower resolution for online use later. If other images are used in the book, they will also need to be provided in high resolution and saved in CMYK format for four-color printing. To learn more about the legal issues of using images that aren’t your own, “5 Top Legal Issues for Authors and Self-Publishers” by attorney Sara Hawkins offers good advice. Printing – A quality printer will provide a high-resolution color proof for final approval before printing. This proof is well worth the money because it shows colors accurately. It’s also your last chance to catch any problems before your book goes to press. The printer will ask you to sign a final approval form and will use this proof for color reference while it’s printing. It’s important to ask your graphic designer to look over the proof as well, since they will see problems with the art you might not spot. If you need help publishing your book, contact the Arion Group. We’d be happy to help.